I got lost in the souks of Marrakech. I tried to find my way in the huge labyrinth but had to give up trying too much. 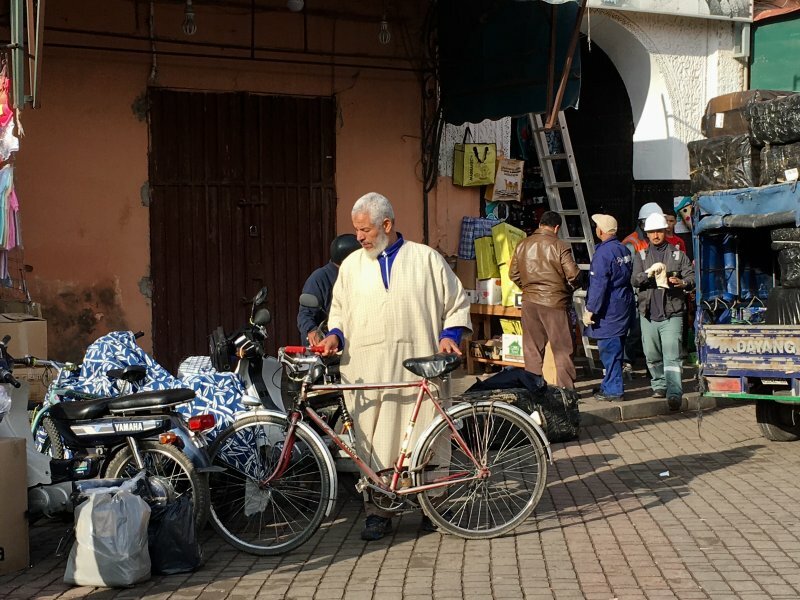 This ancient North African street market is best explored by just walking around aimlessly and without any plans. Just absorb the things that will happen around you. This is Marrakech, the thousands of years old trading hub where traders from countries south of Sahara met the Berbers and Arabs of the north. And where trading caravans with their camels stayed overnight. It’s easy to get lost in Marrakech so just go ahead. Marrakech has for thousands of years been the key trading point in North Africa and that has made the city what it is. Trading was for the Berbers the way to make their living in the desert and it still is a very essential part of life in this North African city. The world has changed a lot with years and tourism grows but the souks of Marrakech are the same. Nothing has changed, almost. All Moroccan towns have a medina in the center. Medina means the old part of a Moroccan city. All medinas used to be surrounded by walls and they contained souks. Most cities still have a medina and a souk but walls around them don’t stand out the time. Marrakech is one of the Moroccan cities that still has its old city wall, 10 m high and almost 20 km long. Some 20 gates let people in and out, some of them huge gateways and others almost invisible narrow passageways. So the Marrakech wall is a pretty massive construction that hides within it the souks and the rest of the old medina. The medina of Marrakech is a huge area of 150 ha. It’s where most of the city’s main sights are. 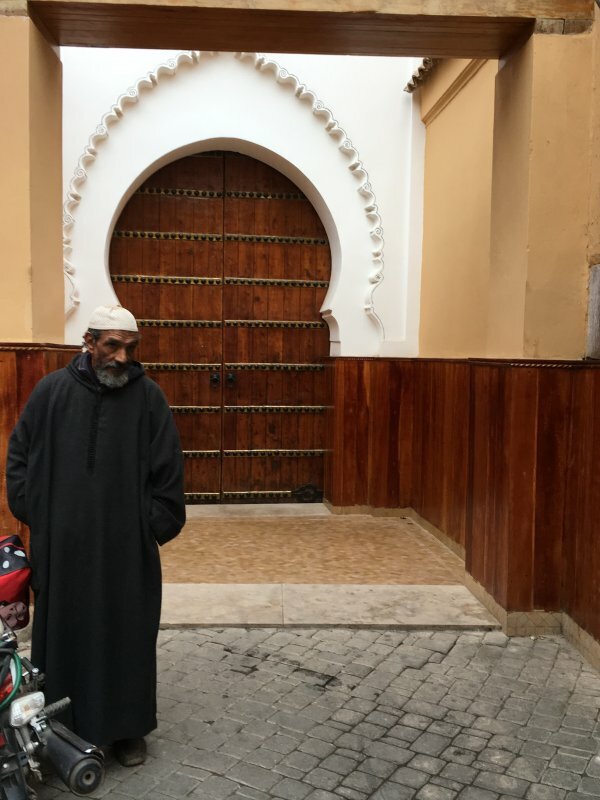 Inside the walls you can find the central square Jemaa el-Fna and the souks north of the square, the old Jewish quarter Mellah, the fine palaces of Bahia and El Badi and a number of decorated pink mosques among them the Koutobia mosque. For these sights check out my previous post The Top Things to Do in Marrakech. Marrakech is pink thanks to the building material they take from the surrounding desert. But in the souks you won’t notice the pink, you will only see the products that are on sale. There is all kind of stuff all over, more than you ever imagine can exist in one place. 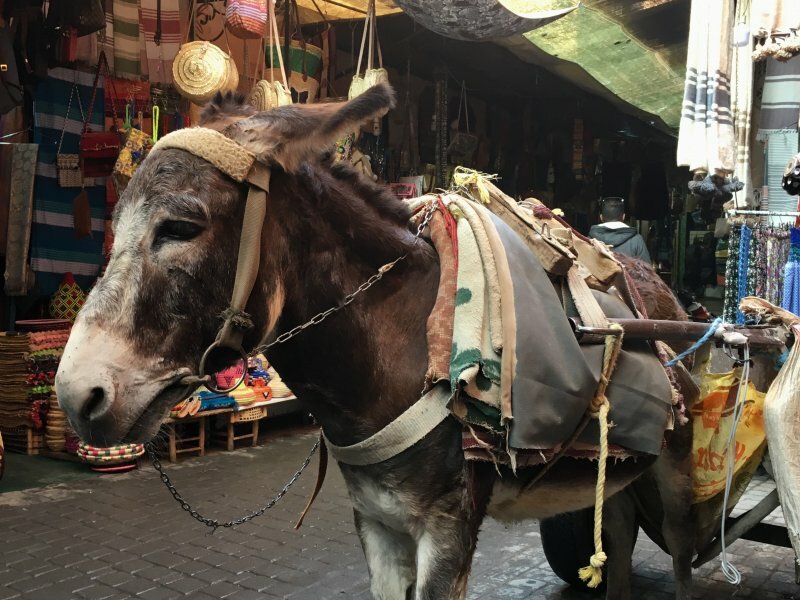 Lanterns, mint tea pots, carpets, berber gowns, leather slippers, dried fruit, exotic spices, belly dance dresses… So, whatever you need you will find in the souks, the local market. Today the ancient souks of Marrakech are a world-famous sight. The labyrinth covers half of the old medina, almost the whole northern part of it. So just dive in and start exploring and don’t be afraid of getting lost. You will find your way out. The map shows where in Marrakech the souks are located. I marked a walking route but it doesn’t guide you much. Just walk where you want. But this is roughly where I think you should go. Skip the maps and use the sun as your compass. After dark use the stars like the Arabs did in the old days. And to make sure you will never get severely lost, download the Marrakech Google map in advance. That lets you locate where you are without roaming with your phone. Rue Smarine is the main street leading into the souks. It’s the first street you will enter from the main square Jemaa El-Fna. This first street gives you a good overview of what is offered in these bazaars – and you will also get a good overview of the bazaar traffic. There are crossing pedestrians, speeding motor bikes and lazy donkeys. There are sellers in traditional robes pushing carriages with huge loads. Then you will enter a tiny square. The square is a perfect place to step aside and observe, without causing traffic delays. From the square pass the arch to get to narrower lanes. But watch out for donkey traffic! 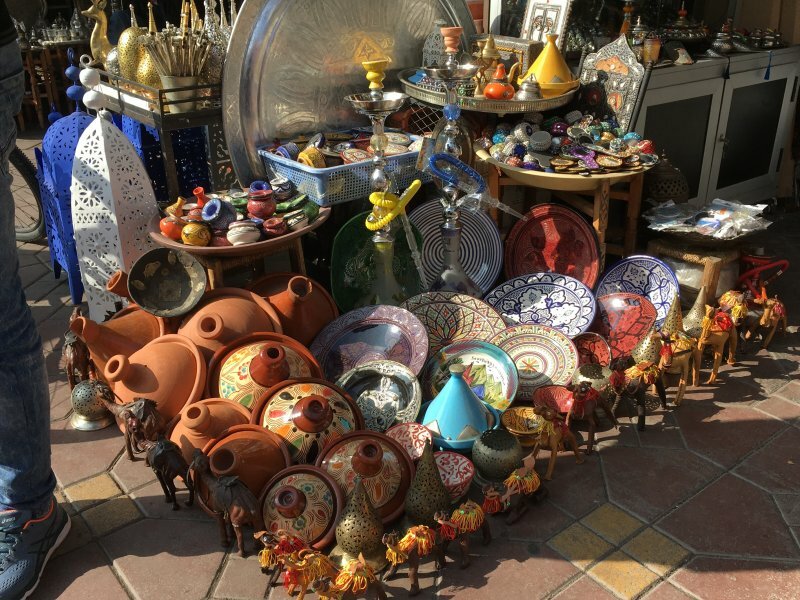 This is a street with tiny shops selling wash basins, mint tea equipment, honey spoons, leather bags, Morocco souvenirs and beautiful looking glasses with metal frames. And a lot more. It never rains in Sahara, almost, compared to where I come from, so no roofs are needed in the souks. So Rue Smarine takes you into a shady labyrinth. Earlier all souks used to be organized on the basis of the types of goods offered and it still works this way, to some extent. That makes it a lot easier to find the things you are looking for. Let’s have a look at different souks. Souk des Ferronniers is at the far end of the labyrinth. It’s where ironworkers create lanters, iron furniture, keys and things like that. Ironworkers’ Souk is a noisy place and you will notice the smell of iron work. And after the noisy, dirty iron section I found something for me, the wool souk I had been looking for. I had seen it in photos and I found it! First there was just a little bit of colored wool hanging at a distance and after a while there was a lot more. I’m not really for knitting or handicraft but this is one of my favorite souks. The Dyers’ Souk has newly dyed wool hanging all over across the alleys. The wool is still wet and dropping a bit. Wool just looks so perfect in the sun. This wool is what Moroccan carpets are made of, the carpets some of which I will show you soon. I had to stay for a while in this souk, staring at the strong colors they are using and hearing how dyers work. And the carpets then? You will find them in the next souk that follows. Souk des Tapis is the carpet sellers’ souk. Carpets need a lot more room than anything else in the bazaar so the shops are bigger here than elsewhere. 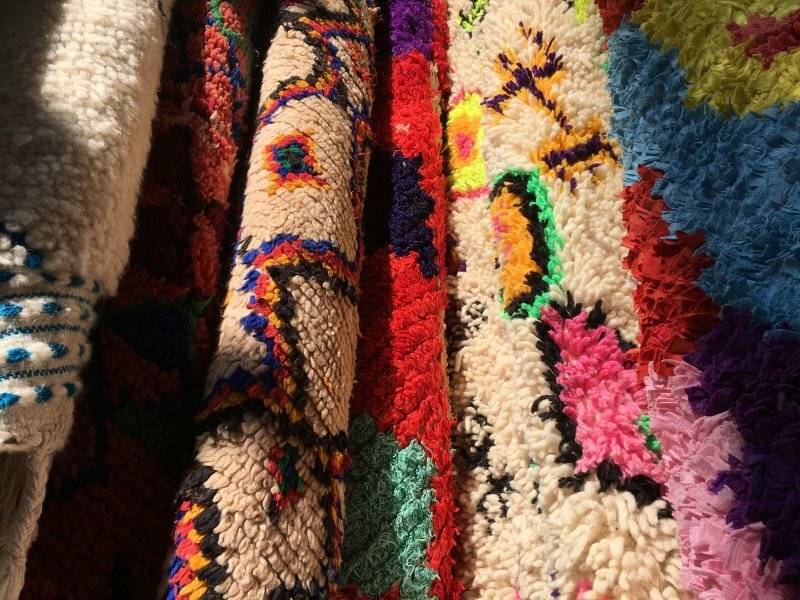 Moroccan carpets from different villages have all their own look. They are made by different tribes and all tribes have their own patterns. Whatever the village all carpets look beautiful. I’d love to start bargaining and see where that will end, but where could I put all the carpets? My house is already full of carpets. Maybe I should buy leather items instead? They are smaller. And then the slippers. Shops in the leather souk and everywhere else sell this kind of slippers. They are babouches, typical Moroccan footwear with a pointy toe. They make them out of soft skin and in all sizes and colors. Babouches must be practical on cold Moroccan stone floors but buying them to my family is a hard thing to do, I don’t know their foot sizes. And last but not least: the spices. If you ever travel to Morocco, don’t forget the spices. Turmeric, chili, pepper, cinnamon, cumin, saffron, coriander… And all the fantastic herbs they use here, beginning from mint. Spices are sold everywhere and they sell them in big sacs because the locals use them a lot. Moroccan food is so good and the taste comes from the spices. But that will be another story. Goodbye for this time! We have seen the souks of Marrakech. wonderful and colourful pics! Is it safe to get lost in souks? how about in the nights? Yes it’s safe to walk there even if you get lost. Sorry, I forgot to tell that they close for the night. Evenings are very crowded so normal caution is needed.